Active ECO helps improve fuel efficiency by controlling certain engine and transaxle system operating parameters. Fuel efficiency depends on the driver's driving habit and road condition. 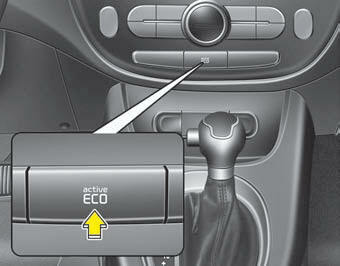 When the Active ECO button is pressed the ECO indicator (green) will illuminate to show that the Active ECO is operating. When the Active ECO is activated, it will remain on until the Active ECO button is pressed again. Active ECO does not turn off when the engine is restarted. To turn off Active ECO, press the Active ECO button again. If Active ECO is turned off, the system will return to normal mode.